It’s easy to forget that agricultural extension can unfold beyond the borders of our own state, but recent back-to-back exchange visits between extension teams from Ohio State University’s College of Food, Agricultural, and Environmental Sciences and China’s Ministry of Agriculture demonstrate that extension has a significant international dimension. Ohio State’s Office of International Programs in Agriculture, working in close cooperation with China’s Ministry of Agriculture and the U.S. Department of Agriculture’s (USDA) Foreign Agricultural Service, welcomed six visitors to Ohio State as part of the U.S. government’s U.S.-China Scientific Cooperative Exchange Program to acquire training in agricultural extension practices and an overview of immerging agro-technologies in the United States. This visit came shortly after six faculty and program educators from Ohio State Extension traveled to China in early August for two weeks to exchange knowledge and best practices on urban agriculture. Dr. Mark Erbaugh, Director, International Programs in Agriculture; Dr. Tom Worley, Director, Ohio State South Centers; Dr. Gary Gao, Associate Professor in Horticulture and Crop Science and Small Fruit Specialist; Pam Bennett, Coordinator, State Master Gardener Program; Mike Hogan, Ohio State Extension Educator; and Dave Scurlock, Viticulture Outreach Specialist traveled to Beijing, Zhengzhou, Nanjing, and Shanghai to meet with faculty and students from the Chinese Academy of Agricultural Sciences, Henan Agricultural University and China Agricultural University to explore how China is transforming its urban food systems. China’s need for urban-based agriculture is particularly important not only because the nation is the world’s most populous with more than 1.3 billion people, but it also has the world’s highest percentage of people (54%) living in urban areas. The urban population has increased by 16% over a 10 year period and is expected to continue to rise significantly in the coming years. “In China, the sheer scale of the population and consumption, and thereby the demand for local food production, is plainly evident,” states Dr. Tom Worley. “Planners for urban agriculture in China have a much greater chance of success than we might expect because of the size of the population to be served . The group also had the opportunity to meet with staff at Ohio State’s China Global Gateway office in Shanghai, one of three international offices within Ohio State’s Global Gateway Program. "The China Global Gateway office provides a vital link between The Ohio State University and various businesses, universities, research institutions, and the extension system in China," says Gary Gao. "We need to look for more ways to tap into this wonderful resource!" 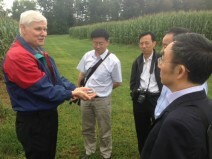 The Scientific Cooperative Exchange Program (SCEP), the USDA-funded exchange program that the Chinese visitors participated in at Ohio State from September 9-18, encourages long-term cooperation in agricultural science and technology, in addition to creating a positive atmosphere for agricultural trade between the two countries. Ohio State, through the Office of International Programs in Agriculture, most recently hosted five Chinese scholars seeking training in sustainable plant protection in 2012, and administered two other SCEP initiatives focused on animal health and food science prior to that. During the SCEP group’s 10-day stay in Ohio, they not only visited with faculty and researchers within the College of Food, Agricultural, and Environmental Sciences (CFAES) located on Ohio State’s main campus in Columbus, but also at the Ohio Agricultural Research and Development Center (OARDC) in Wooster, Ohio State South Centers in Piketon, and the Western Agricultural Research Station in South Charleston. Each of these sites allowed the visitors to observe up close how Ohio State CFAES faculty conduct innovative research and simultaneously work alongside Ohio State Extension Educators to provide integrated knowledge to Ohio’s over 75,000 agricultural producers and other agricultural-natural resources stakeholders. Inherent differences between China and the United States’ extension models provided an opportunity for both the Chinese visitors and those who work in or with Ohio State Extension to examine agricultural outreach from a different perspective than what they are normally accustomed to. 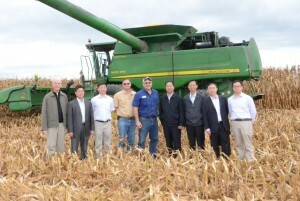 While extension systems here in the United States are organized and implemented through their state’s respective land-grant institution, China’s agricultural extension system is carried out under the National Agro-Tech Extension & Service Center (NATESC), a government agency under the Ministry of Agriculture, where it is charged with introducing and disseminating agricultural technologies in the areas of crop cultivation, soil improvement, pest management, water conservation, and pesticide application. “China’s extension system for supporting agriculture is very top-down, large scale, and compartmentalized,” explains Dr. Mark Erbaugh. “The integrated linkages that we’re used to seeing in extension systems here in the U.S. are not as apparent in China’s extension system”. Recognizing that an effective extension system does not exist without strong public-private partnerships, program trainers focused on introducing the SCEP participants to the many activities that CFAES academic departments and Ohio State Extension are engaged in to maintain Ohio State’s strong ties to the agricultural industry. For instance, visitors were able to see first-hand how the Department of Food Science and Technology’s Wilbur A. Gould Food Industries Center delivers much needed services to Ohio’s food industry within their own pilot labs, while at the same time providing students with applicable skills that will make them competitive after graduation in those same industries. Valley Vineyards Winery, Dole Food Company, Little Miami Flower Company, and Turkey Run Angus Farm all served as valuable site visits across the state to demonstrate these important linkages between agricultural stakeholders and Ohio State University Extension. Since the visitors were extension administrators themselves, they took great interest in how the leadership of Ohio State Extension strategically manages 680 Extension staff across Ohio, adapts to challenging funding environments, and continuously develops programs so that Ohio State Extension remains innovative and receptive to its constituencies in the 21st century. SCEP participants were especially grateful to meet with Dr. Keith Smith, Associate Vice President of Agricultural Administration and Director of Ohio State University Extension, to discuss these issues and to better understand how they might improve their own extension programming in China. This discussion complemented the insight gained from earlier visits in the week to both the Clark and Pike County Extension offices, where extension staff were on hand to discuss and show how a county extension office operates on a daily basis. The 2014 Farm Science Review in London, Ohio brought the program to a strong conclusion for the visitors, who were eager to attend the annual three-day agricultural exhibition that draws more the 130,000 agricultural producers, industry professionals, and members of the public each year. “Before coming here, we heard of how diverse and prosperous Ohio’s agriculture was,” said Mr. Shengdou Chen, the SCEP delegation’s leader and Director General of NATESC in Beijing, China. He said that the number and variety of agricultural exhibits that he and his colleagues encountered at the Farm Science Review certainly reinforced this notion. Both extension teams from Ohio State and China’s Ministry of Agriculture gained an invaluable understanding of each other’s agricultural systems, and discussions have already begun between the two teams to determine how continued cooperation between Ohio State University and China’s Ministry of Agriculture can be mutually beneficial in the future.